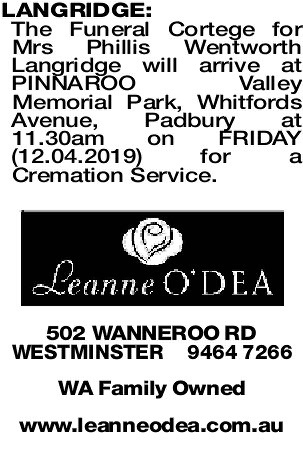 The Funeral Cortege for Mrs Phillis Wentworth Langridge will arrive at PINNAROO Valley Memorial Park, Whitfords Avenue, Padbury at 11.30am on FRIDAY (12.04.2019) for a Cremation Service. Passed away peacefully on 4th April 2019. After such a long wait, finally united with her beloved Bert. Much loved mother of Trisha, Robyn and Kathy. Adored Granny of Stephanie, Kim, Carley, Nicola, Rocheen and Declan. Loved Great Grandmother of Perica, Lucia and Annika. Heartfelt thanks to all Juniper Pilgrim staff for their love and care. 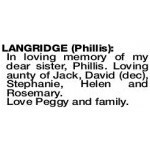 In loving memory of my dear sister, Phillis. Loving aunty of Jack, David (dec), Stephanie, Helen and Rosemary. Totally devoted mother and granny to girls, girls, girls (and Declan). Many happy memories of holidays with Aunty Phillis and the girls. Love to Trisha, Robyn and Cathy. Coralie and family. LANGRIDGE PHILLIS Beautiful memories of our dear Auntie Phillis who welcomed us into her home with such warmth and cheeky humour.